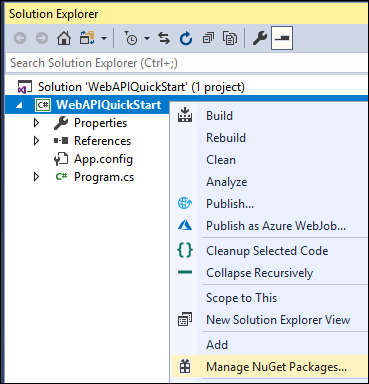 In this quick start you will create a simple console application to connect to your Common Data Service environment using the Web API. You will authenticate and use an HttpClient to send a GET request to the WhoAmI Function the response will be a WhoAmIResponse ComplexType. You will display the UserId property value. This is a very simple example to show how to get connected with a minimum of code. The following Enhanced quick start will build upon this sample to apply better design patterns. This screenshot shows the name WebAPIQuickStart, but you can choose to name the project and solution whatever you want. When you are running your project/solution in VS 2015 in debug mode, you may not be able to connect. This happens regardless of whether you are using a Target Framework of 4.6.2 or higher. This can occur because the Visual Studio hosting process is compiled against .NET 4.5 which means by default it does not support TLS 1.2. You can disable the Visual Studio hosting process as a work around. Right-click on the name of your project in Visual Studio and then click Properties. On the Debug tab you can uncheck the Enable the Visual Studio hosting process option. This only impacts the debug experience in VS 2015. This does not impact the binaries or executable that are built. The same issue does not occur in Visual Studio 2017. In Solution Explorer, right-click the project you created and select Manage NuGet Packages... in the context menu. Browse for the Microsoft.IdentityModel.Clients.ActiveDirectory NuGet package. Select Version 2.29.0 and install it. Do not install the latest version of this NuGet package. This sample depends on the capability to pass user credentials without a separate Azure login dialog which is not available in the 3.x version of this library. You must select I Accept in the Licence Acceptance dialog. Browse for the Newtonsoft.Json NuGet package and install the latest version. //Get the response content and parse it. From the https://web.powerapps.com site with the appropriate environment selected, select Settings and choose Advanced Customizations. Then select Developer resources. In the Developer Resources page, look for the Instance Web API value and copy it. For the userName and password variables, use the same credentials you used to log into the https://web.powerapps.com site. You have successfully connected to the Web API. 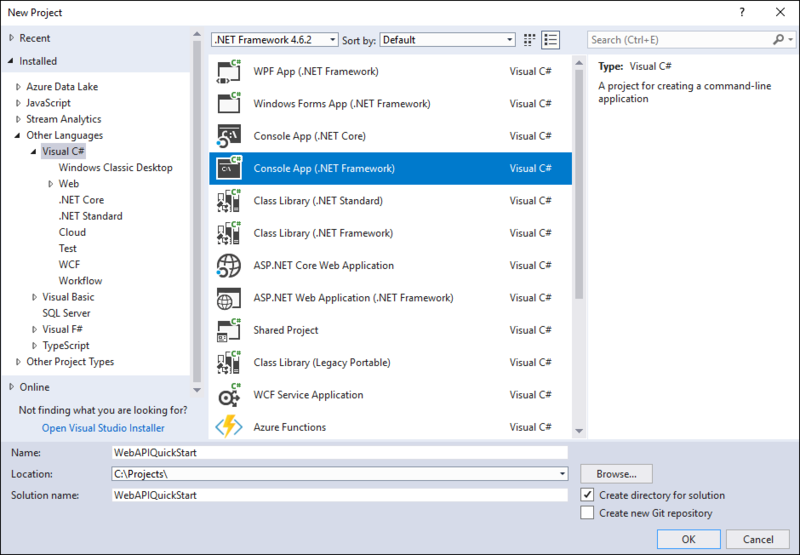 The quick start sample shows a simple approach to create a Visual Studio project without any exception handling or method to refresh the access token. This is enough to verify you can connect, but it doesn't represent a good pattern for building an app. The Enhanced quick start topic shows how to implement exception handling methods, basic authentication method using connection string, a re-usable method to refresh the acces token, and introduces how to build re-usable methods to perform data operations. Learn how to structure your code for a better design.